How Much Is Your Time Worth? Are You Getting Paid What You Deserve? Fran Cannon can show you proven Ways to Raise Your Prices and Attract Higher Quality Clients! Download this Report Now! 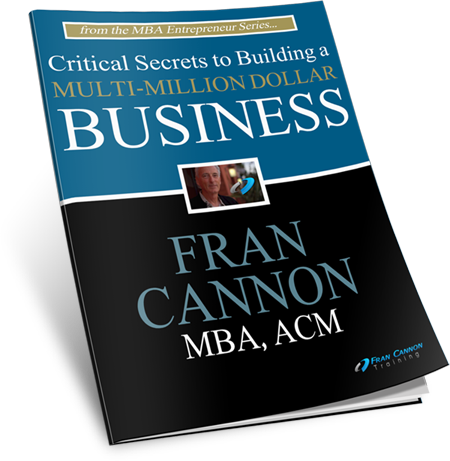 Fran Cannon MBA,ACM written specifically for Small Business Owners and Entrepreneurs. In this dangerous economy you can’t afford to make mistakes. Learn critical insights that will help you create a multi-million dollar business. Many entrepreneurs go into business wanting to create a business when they suddenly realize they’ve created a job. If you want to take your business to the next level this is the next step. the email list to get the report and join our circle of influence. Fran Cannon MBA ACM Fran holds an MBA in Business Management and a Masters Degree in Contracts. He taught courses for the US Navy, General Atomic, General Dynamics, Hughes, West Coast University and Income Builders International. Personal Development Seminars: Fran has led over 20,000 hours of Seminars teaching people how to develop Superior Attitudes and Skills. Join our "Circles of Influence" here on FranCannon.com and social networks Linkedin, Facebook, Twitter, Google+, youtube, etc. Entrepreneur? Inventor? Author? Fran Cannon has worked with start up and emerging companies for over a decade. There is a set of Superior Attitudes and Skills that can help you create Superior Results in your life. These Attitudes and Skills can be use inyour Personal, Professional or BusinessLife to create a life that is Magnificent. These Attitudes and Skills are nottaught in any school or college but Fran will share some of them with us at our next meeting. So join us and learn howeasy it is to be Magnificent!